The Western genre is one that, due to its intense popularity for several decades, can be difficult for some artists and filmmakers to find originality in. Riddled with its own set of cliches and tropes, the genre has only just recently started to make a comeback in American cinema. 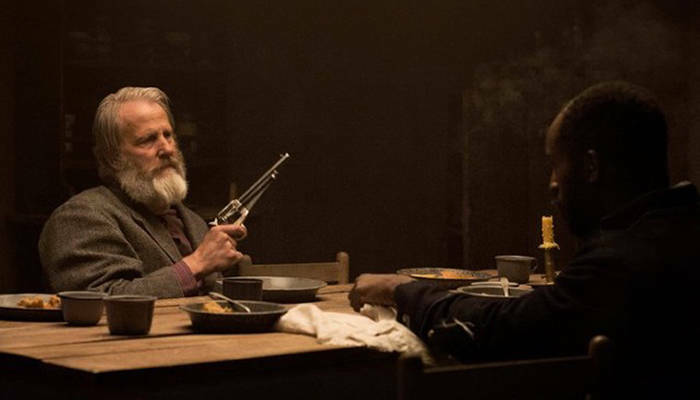 Thankfully, with Godless—Netflix’s new seven-part Western series from creator Scott Frank and executive producer Steven Soderbergh—we’ve gotten one of the best and most detailed additions to the Western genre to come along in recent years. Set in the year 1883, the series centers around the fictional mining town of La Belle, which is run and populated almost entirely by women. The reason for this unique demographic being an intense tragedy that swept through the town less than a year prior to the events of the series, when “83 good men” were all simultaneously killed by an explosion in the mine, leaving their wives suddenly without husbands. Understandably, that tragedy—among others—hangs over the lives of everyone in La Belle. But in case the citizens of the town didn’t already have enough on their plates to worry about, they’ve also been unwittingly set on a collision course with the notorious outlaw Frank Griffin (Jeff Daniels) and his entire gang of murderous followers, who have their sights set on tracking down and killing Roy Goode (Jack O’Connell), a former member of the gang and the boy who Griffin once considered to be a kind of son to him. Unfortunately for everyone in La Belle too, the series starts with Roy stumbling into the care of Alice Fletcher (Michelle Dockery) – a widowed rancher and town pariah – who isn’t initially aware of the violent baggage that Roy brings with him. And with La Belle’s sheriff Bill McNue (Scoot McNairy) suffering from a gradual loss of his eyesight, by the time we’re first introduced to it, the town is all but defenseless to the inevitable attack it’ll be facing by Frank and his men. Those are two very different plots for Godless to try and navigate through, but by wisely placing the pair of them on interconnected paths with each other, Frank manages to inject the series with an underlying tension from the very beginning. And that helps the series maintain some kind of forward momentum throughout it, even as it often meanders and takes its time getting through its plot. But that’s the biggest issue with Godless in the end, which runs for seven full episodes (most of which run over an hour long) and struggles to not feel at times like it’s nothing more than what would have been a fine two-hour long movie stretched out into a miniseries. 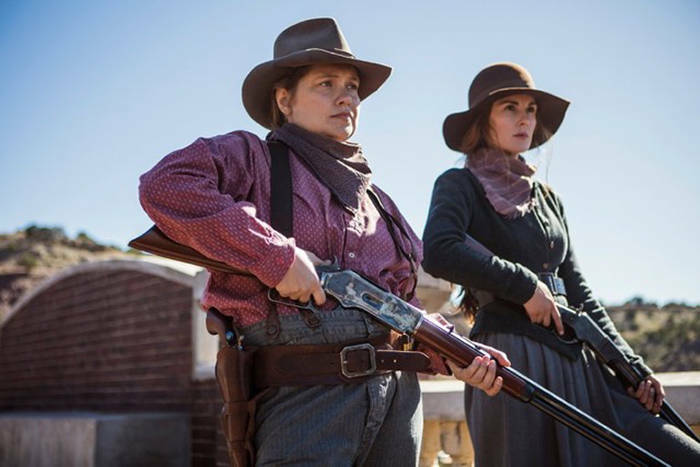 That might have been a bigger issue, though, if Godless wasn’t as genuinely enthralling as it is, thanks to the show’s large cast of characters and locations, all of which we gradually learn more about as time goes on, until the world of the show feels about as full as it possibly can. 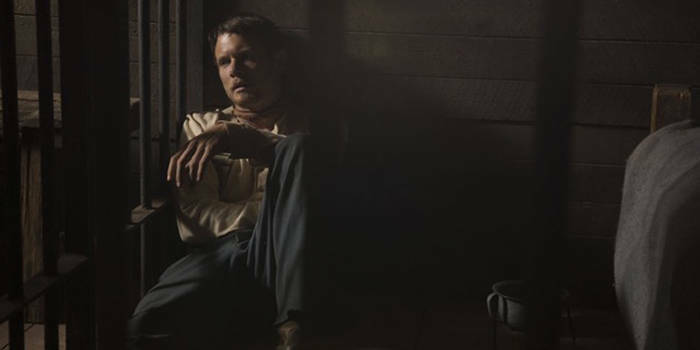 So while it’s true that many will find Godless to be too leisurely of an experience for them—there’s a 10-minute-long sequence just of a character breaking in a horse in one episode, for instance—the intimacy that forms between the viewer and the show’s characters throughout makes it difficult to fully condemn the series’ slow pacing. It doesn’t hurt either that Godless offers up some of the best TV performances of the year so far. Jeff Daniels turns Frank Griffin into more than a formidable villain for the series, playing him as a self-righteous outlaw with a knack for taking on the persona of a preacher, spouting the gospel of both violence and family for all to hear. It’s fitting then that Jack O’Connell play Roy Goode in the exact opposite way, as a quiet man less proud of the violence he’s committed. As the two lead male characters in the series, they form a compelling dynamic together, even despite spending most of the show’s runtime apart. In addition, Merritt Weaver stands out as Mary Agnes, who has taken to wearing her husband’s clothes and carrying his guns, instead of her old dresses and corsets. Judged by those around her for her willingness to take on traditionally male responsibilities, Mary’s love of La Belle is one of the best emotional threads that Godless has, especially as she fights to try and keep it from being taken over by the male-run mining corporations, which see La Belle as a town ready to be taken advantage of, thanks to its predominantly female population. In a feature film, it’s likely that characters like Mary or most of the La Belle townsfolk would have been cut from its story, but Godless dedicates every minute of its runtime to developing and further delving into the lives of its characters. With its sparing use of flashbacks in later episodes as well, the show is able to shade in the relationships between characters like Frank and Roy, until their bond is poetic enough to outgrow its cliched origins. Combining all of that with some of the most stunning TV visuals you’ll see this year, and Godless ends up being the kind of emotional, sweeping Western we rarely get to see nowadays, and one well-worth investing your time in this Thanksgiving break weekend.